In 1908, conjoined twins Daisy and Violet Hilton were born in England. About 55 years later, Colleen Burke and her twin sister were born - five minutes apart separated by three years. Burke was born with two vaginas and her sister was born severely disabled with Cerebral Palsy. Presented as part of La Mama Theatre's Exploration season for work in various stages of development, and under the dramaturgy of Doug McLeod, Burke's Cleave explores the relationship that each set of twins has and - despite the decades between them - the similarities shared between their lives. Having only completed the story very recently, Burke performs a scripted reading of Cleave while placing a select number of props on the stage. There is a toy train set, a sculpture of two fused humans embracing, a photo of the Hilton twins and a rolling pin. There are also a number of props revealed throughout the show, which - especially during a scripted reading - allow us to remain visually engaged with the performance. At times, Burke breaks from script and describes to us how she envisions the following scene taking place, and it will be interesting to see how these various ideas are actually executed. 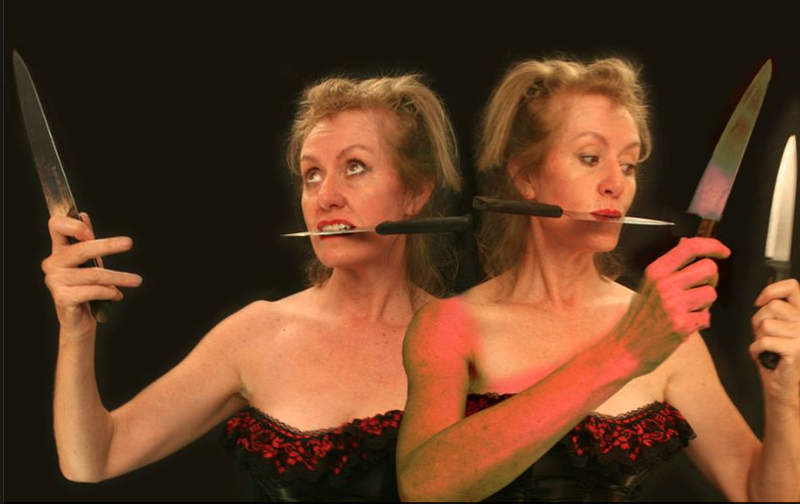 As a skilled puppet maker and puppeteer, Burke's main goal is to play both the conjoined twins where she is one twin and the other twin is a puppet manipulated by her. Burke's research into the Hilton twins' lives is detailed and the parallels between their experiences and that of Burke's sister and her own are tied in well. There are moments however when switches between the three stories could be more closely linked with the theme of the anecdote being explored as this would allow for not only a smoother transition into the next story but a more fluid and easy-to-follow story. Cleave starts off strong with the stories being presented as performances by the various characters within the lives of the four women, and the intended use of puppets. Towards the second half, it seems to turn more into Burke re-telling much of her life and that of the twins' with little performance aspect to it. While the stories are engaging, that performative aspect from earlier greatly assists in entertaining the audience and taking the show to the next level. Furthermore, it may also prevent Burke from breaking "character" when recalling the more emotional moments of her own life. While Cleave is very much a work in progress, Burke has managed to create a captivating story that deserves to get bigger and better and come to fruition on stage as a fully developed piece, and I look forward to seeing this work in its next phase. Cleave was performed between 6 - 8 December at La Mama Theatre. * Original review appeared on Theatre Press on 11 December.